I’m pleased to let you know of a new joint SAP and Questionmark white paper on implementation best practices for learning, training and assessments in regulatory compliance. You can download the white paper here. There has been a huge change in the regulatory environment for companies in the last few years. 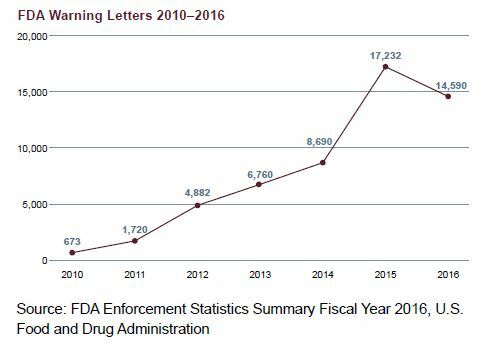 This is illustrated nicely by the graph below showing the number of formal warning letters the U.S. Food and Drug Administration (FDA) issued in the period from 2010 to 2016 for various compliance infractions. Of course it’s not just letters that regulators issue, there have also been huge increases in the fines issued on companies in areas including rules breaches in banking, data protection, price-fixing and manufacturing. Failure to effectively train or assess employees is a significant cause of compliance errors, and this white paper authored by SAP experts Thomas Jenewein, Simone Buchwald and Mark Tarallo and me (Questionmark Founder and Executive Director, John Kleeman) explains how technology can help address the issue. An Assessment Management System can be used to diagnose the training needed, to help direct learning and to check competence, knowledge and skills. A typical LMS includes basic quiz and survey capabilities, but when making decisions about people, such as whether to promote, hire, fire, or confirm competence for compliance or certification purposes, companies need more. The robust functionality of an effective assessment management system allows organizations to create reliable, valid, and more trustworthy assessments. Often, assessment management systems and LMSs work together, and test-takers will often be directed to take assessments by using a single sign-on from the LMS. The white paper describes how companies can use SAP SuccessFactors Learning, SAP Enable Now and Questionmark software work together productively to help companies manage and deliver effective compliance learning, training and assessments – to mitigate regulatory risk. It goes on to describe some key trends in compliance training and assessments that the authors see going forwards, including how cybersecurity and data protection are impacting compliance. The white paper is a quick, easy and useful read – you can download it here.